With all of the college scholarship search websites available, it would seem that getting a scholarship to pay for school has never been easier. Unigo’s scholarship match offers to match students to 3.6 million college scholarships worth over $14 billion. And Scholarships.com tells you that there are over 3.7 million scholarships worth $19 billion just waiting for you. How hard can it be to get a scholarship? Actually, the truth is that the internet has made it easy to find out about numerous college scholarships students might qualify for. The student still has to apply for the scholarship and is competing with all of the other students who used the same search websites to find the scholarship. Another truth is that the private outside college scholarships (those not awarded by the school the student is attending) available generally only make a dent in the cost of attending a public university. Make it a scratch for attending a private school. According to the last Private Scholarship Count sponsored by the Scholarship America and National Scholarship Providers Association, in 2005 “Approximately 7 percent of undergraduate students received private scholarships, with an average value of $1,982.” The percent likely hasn’t changed much since Private and Employer aid (outside scholarships and tuition reimbursement programs) made up only 13% of sources of grant aid in 2011-12. The average cost of attendance for public flagship universities is over $30,000 a year for the most prominent institutions. Finding private college with total cost less than $50,000 is becoming increasingly difficult. It’s going to take a lot of $2,000 scholarships to significantly reduce a student’s out-of-pocket costs. Of course, that doesn’t mean students shouldn’t try for private scholarships. They should just make sure they understand the ratio of effort they’ll have to put in relative to the possible payout. Ultimately, I would argue that the effort would be better spent targeting schools for merit scholarships. However, I realize that there are plenty of people out there with more energy and ambition than me. So if you’re going to make a serious effort for private college scholarships, you should know the following. 1. Don’t pay for a scholarship search service. There are plenty of reputable FREE scholarship websites available. It’s highly unlikely that paying someone will result in scholarship information that you wouldn’t have found yourself. If you’re willing to pay someone to search for scholarships so that you don’t have to, then you probably don’t need to be chasing outside scholarships. Increasingly, you’ll come across no essay scholarships or you deserved it scholarships. These scholarships simply require the student to register for a monthly drawing and possibly win the scholarship. Some larger scholarships may be a once a quarter or once a year drawings. What you need to be aware of is that the scholarship sponsors are likely selling the students’ personal information when they register. Student loan companies are frequent buyers of this information. Therefore, if you decide to participate in such drawings, and why not if you have a chance each month, be aware of what you’re getting into. Check the opt-in and privacy disclosures so you understand exactly what information you’re giving away and what to expect. At the very least, use an email address set up just for this type of use so you aren’t forever trying to stop unwanted college funding options from showing up in your mailbox. 3. All the college scholarship websites will have varying degrees of reliability. Some will do a better job of narrowing results to your qualifications while others will have fewer outdated scholarships. Then there’s going to be difference in your ability to actually access the contact information once your find them. Some make it more difficult than others. Ultimately, you’re probably going to want use a combination of websites to maximize your chances of finding scholarships. 4. You will have better chances at getting local scholarships. These are the scholarships that turn up through your high school counselor’s office, your parent’s workplace, or in the local paper’s community section. They aren’t as easy to find so not as many people will be applying for them. This means less competition so you’re more likely to win. Check with you counselor or library for possible resources that collect the information in one place. 5. Most of the scholarships will be for one year only. You will have to repeat this process every year. So pay attention to scholarships that are multi-year or allow you to apply and win more than once. 6. Outside scholarships, that’s what we’re talking about here, have to be declared to your school’s financial aid office. They can affect your financial aid award from federal and institutional sources. In other words, schools may reduce the amount of the financial aid they award by the amount of the outside scholarships. Colleges consider these outside scholarships the equivalent of income, money you may have earned from a job or been given by Aunt Joan. Therefore, your financial need is reduced by the amount you receive. Most colleges have a policy on how much you can receive in outside scholarships before reducing their award. You’ll have to check with each college. 7. 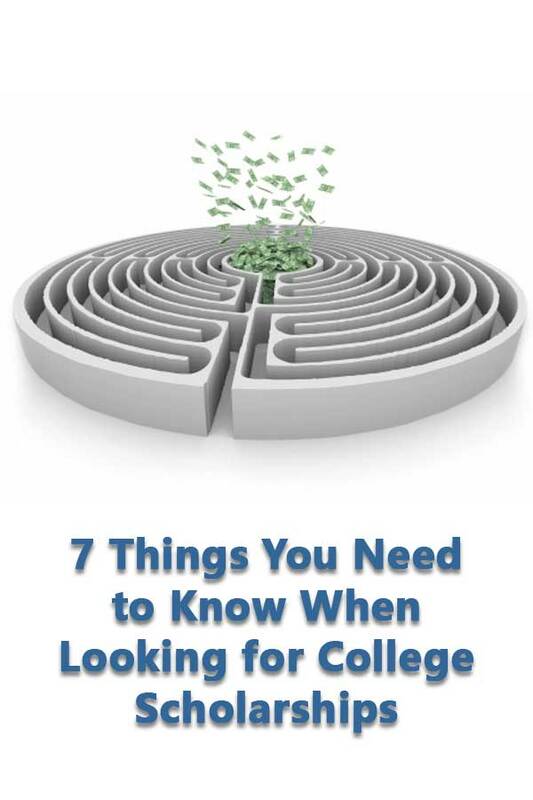 To get the most out of private scholarships, be organized and apply for as many as possible. This means track deadlines, requirements, and recommendations in one place. Give yourself time to write the essays and try to ask for any letter of recommendations at one time. Syracuse University has a scholarship tracking grid and the University of Phoenix has a spreadsheet you can download to track scholarships. Remember, you don’t have to be a junior or senior in high school to apply for all scholarships. You can be as young as 13 to apply for some scholarships. If scholarships are part of your strategy for paying for college, start looking as soon as possible. Get the Best Free Resources for Finding and Paying for College Guide and you’ll also receive the Scholarship Search Toolkit.